In this issue, we see that Queen Alflyse of the Dark Elves seeks sanctuary with the Dwarves of Nidavellir, promising them exclusive mining rights in the choicest regions of Svartalfheim. Having seen the more fanatic and militaristic Dark Elves in the previous issue, this one does right by presenting the other side of the coin, and showing how tightly-wound the various races of the Nine Realms are with each other, especially once you pair the Dark Elves with the Dwarves, who are almost natural enemies. And this is reflected in the reaction of the two groups to each other once Alflyse’s delegation arrives at Nidavellir. Once the specific world-building elements are done, and we get a deliciously nice action-packed cameo from Malekith himself, we get to see Thor in full as he is given command of the League of Realms and is then sent to Nidavellir to offer Alflyse the protection of the Congress of the Worlds, the sort-of ruling body of the Nine Realms. Each member of the League is a power-house unto themselves, or so we are led to believe. And just like any such grouping of heroes, they all have their differences with each other, which are brought out in full once they reach Nidavellir and find that things have already gone south. Jason bookends the issue with the League’s first fight as a team, which they ultimately fail, but the fun is in seeing the simmering antagonism between all of them, including Thor who is almost ready to knock some heads to get them all to work as a team rather than as individuals. Through each of these new characters, we get to see more of this bold new vision of the Nine Realms and get a sense of the true scope of the entire setting. With the 11-issue Gorr the God Butcher arc Jason Aaron focused on the titular hero himself in a story that was distinctly space opera/science fiction. With this new arc, he looks set to focus on a diverse cast of heroes that has a distinct epic fantasy flavour. I love that dichotomy, more so since it really allows me to see what kind of a background Thor comes from, what the Nine Realms really are like. Ron Garney’s pencils are fairly decent, a bit better than they were in the last issue. There is a distinct lack of polish in the pencils, and many of the characters, whether major or minor, appear to lack some definition in their face as well. Largely, while its nowhere near on the same level as Esad Ribic’s magnificent work in the first arc on the series, it is still good. His art style stands out. And he is more than ably helped along by colourist Ive Svorcina who does an amazing job with the colour-work, really infusing a ton of energy into the issue, energy which speaks volumes as to how good of an artist he is. With this issue, it is quite clear that Jason Aaron & Co are off to another great arc. While the comic version of Malekith is very different from the movie version, the former is what I love and prefer by a considerable margin. I love Garney and Svorcina’s rendition of the villain. With this week’s issue, which marks the midpoint of the Malekith the Accursed arc, Jason Aaron and Ron Garney take the reader to Alfheim, the realm of the Light Elves and all their similarly-aligned brethren. This forms the first half of the issue and is largely meant to resolving some of the conflict between the various members of the League of Realms, since there are some really strong differences of opinion among them. The second half then takes us to Jotunheim, the land of the Giants. And it is here that we see some big-scale action against Malekith and his armies, as well as a fairly major twist. Largely, I enjoyed this issue. Thor looking to resolve the differences between the members of the League stood out as a really mature thing to do, something that fits in with his role as the leader of these disparate heroes and the future king of the Aesir, the son of fallen Odin and the All-Mother Freyja. There is a certain cheesiness to the first half, almost trademark Jason Aaron humour, and that keeps the plot ticking, even though the main narrative barely advances. There were a couple questionable moments, such as Thor sharing a passionate kiss with Lady Waziria of the Dark Elves, and Malekith just killing a random pixie/faerie, but aside from that, the first half served to ground the entire League in the real and the believable. The second half is much better since we get to see Malekith up close and see him being very much a badass. Of course, there’s a strong emotional moment towards the end as well, which finally hits home the fact that Malekith is dangerous and that his war on the Nine Realms will definitely tear them all apart from each other. This is the half that is completely taken up with the action, and its nice to see some unrestrained combat from both sides, since that was a missing component of the entire arc thus far. While Jason Aaron does well to expand on the mythology that he is reworking here in this issue, I felt that the story spent too much time on that, and not enough on the main narrative, which only served to work against it in the end. I want to see more of Malekith doing things, rather than being relegated to cameo appearances. He is no Got Butcher, that’s for certain, but I would like him to be, in terms of his commanding presence as a major villain of the Nine Realms. In the end, with the twist that comes on the final page, the story looks set to move into the major leagues yet again, so next month’s issue, part four of this arc, should prove to be interesting. With the art, I’m thinking that a dedicated inker is definitely needed to help Garney’s pencils with Ive Svorcina on the colours. The lack of definition in character faces has expanded to the general character-work as well. 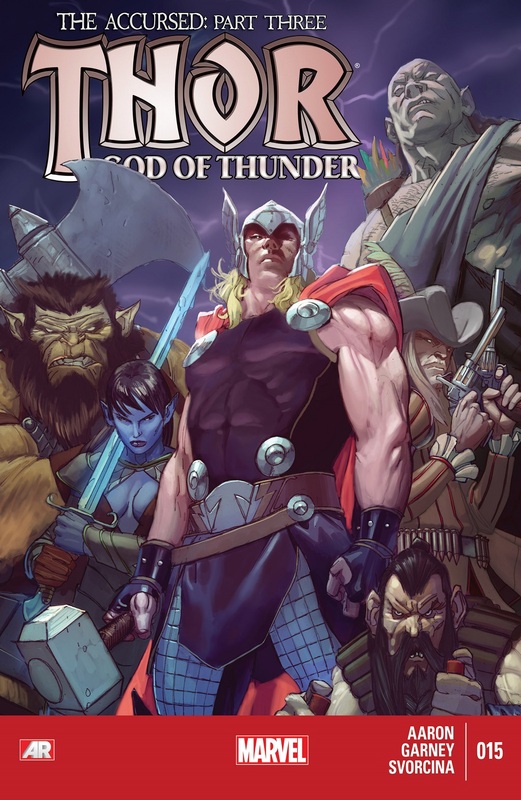 That’s really the only fault in the artwork, since Garney/Svorcina’s Malekith is excellent and the final page contains a moment that all the people who’ve seen the first Thor movie should be well familiar with, and is one of the finer examples of Garney’s art. Slight step taken back this month, but this still remains a fun series, first and foremost. In that, the comic is very much like the movies themselves. They don’t take themselves seriously, just focus on telling a good story. 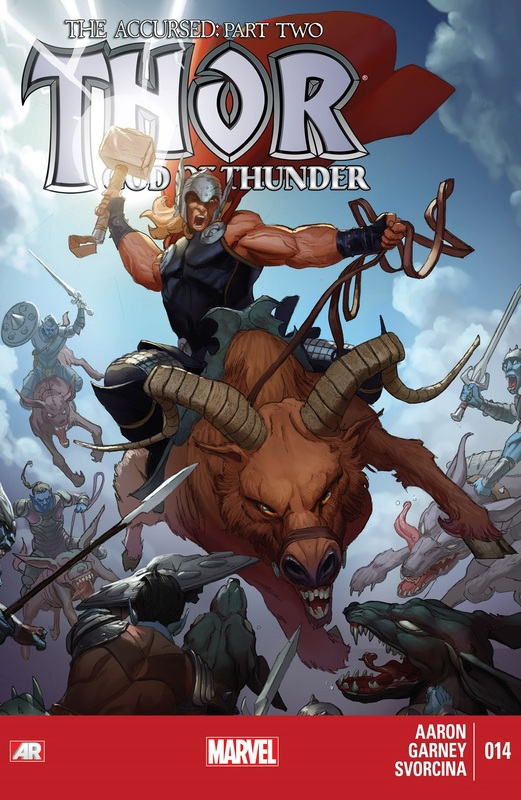 More Thor, God of Thunder: #1, #2-4, #12, #13. Posted on November 15, 2013, in Comics Reviews, Review Central and tagged Comics, Comics Review, Dark Elves, Dimensional Fantasy, Epic Fantasy, God of Thunder, Gods, Malekith, Malekith the Accursed, Marvel Comics, Norse Gods, Norse Mythology, Review, Review Central, science fantasy, Space Opera, Thor, Thor: God of Thunder. Bookmark the permalink. 4 Comments.